America Rising LLC | PAC | America Rising Squared | Definers Public Affairs. Definers Public Affairs has sought to discredit opponents in part by spreading misleading stories via a network of right-wing sites—and through Facebook. 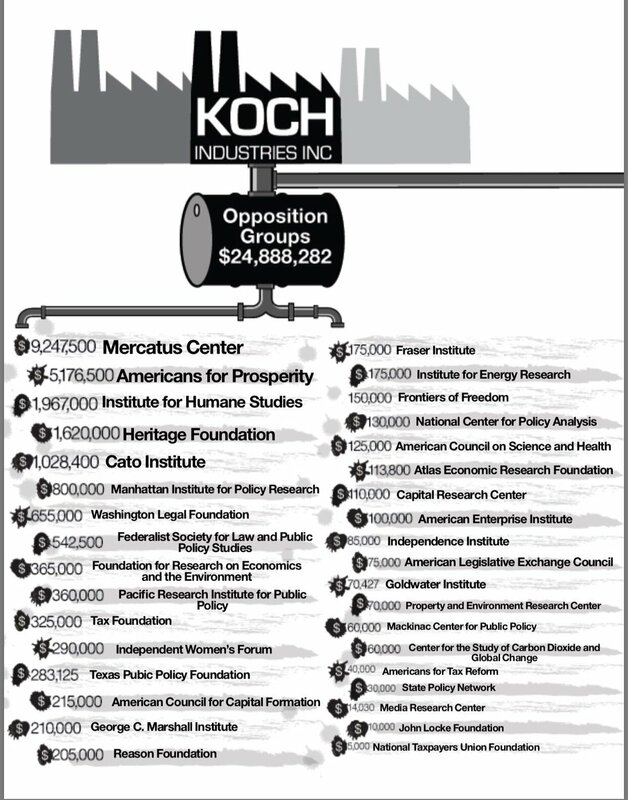 The Koch Brothers Have Been Waging A War On America For 50 Years. This Is How They Are Winning. Quote: Warren Buffett just announced that the new tax bill put $29 billion in his pocket. Charles and David can expect to net at least that much, maybe more, which makes their $400 million dollar investment a particularly good deal for them. A big part of their agenda is protecting the investment they have already made in buying Supreme Court justices. 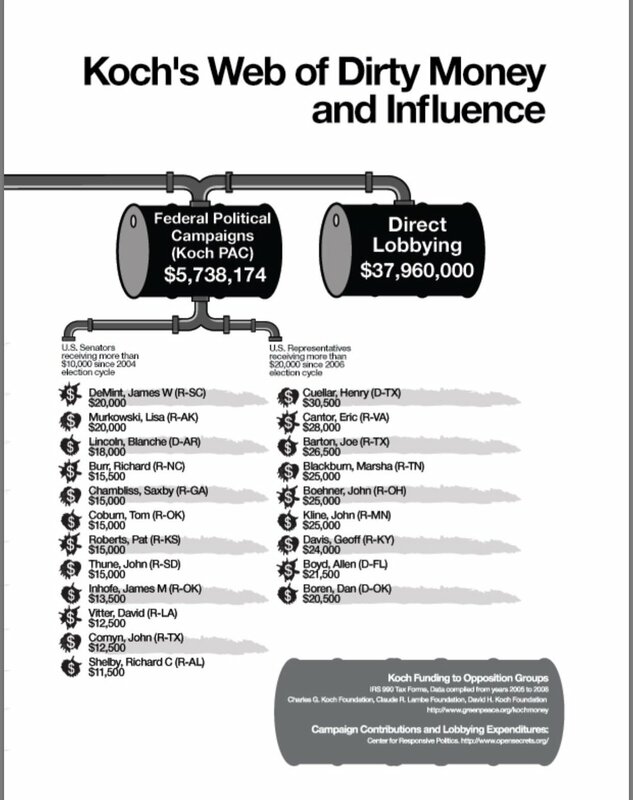 They have every intention of stocking the federal and state courts with their disciples. Roberts, Thomas, Alito, and Gorsuch are all Stepford judges who were nurtured by the Federalist Society. In the memo, the Kochs say they will pull out all the stops to get another dutiful soldier who will faithfully carry out their orders on the court. “If President Trump nominates a principled, constructionist nominee for Justice Kennedy’s seat or any other vacant seat, we anticipate engaging with both grassroots and under-the-dome tactics, bringing paid and earned media and events to support the confirmation,” the memo states. That memo goes on to say the application of suasion by the Koch network (translation: money) was enough to convince three Democrats — Joe Manchin of West Virginia, Heidi Heitkamp of North Dakota, and Joe Donnelly of Indiana — to cast votes in favor of Neil Gorsuch. What does any of this have to do with clean tech? Only this. The Kochs were behind the decision by the #FakePresident to withdraw the United States from the Paris climate accords. They are also fierce opponents of the Clean Power Plan and have backed the repeal of a raft of federal regulations on pollution and exploitation of public lands by private companies, including fuel economy standards for motor vehicles. They advocate against any policies that favor renewable energy, especially rooftop solar for private homes. If they have their way, America will still be using coal and fossil fuels to power its economy — what’s left of it — far into the future. Quote: Taken together, AFP’s grassroots volunteers and staffing rival those of the Republican party itself. However, AFP is not a free-standing political party – but instead is an extra-party organization that parallels and leverages Republican candidates and office-holders. By providing resources to support GOP candidates and officials, and exerting leverage on them once elected, AFP has been able to pull the Republican party to the far right on economic, tax and regulatory issues. A close examination of AFP’s early chapter buildup in Wisconsin lets us see exactly how AFP has achieved such clout – and also helps us make sense of Scott Walker’s early and sustained attacks on public-sector labor unions. Our research has uncovered several important aspects of AFP’s roll-out and impact in Wisconsin. First, AFP-Wisconsin (AFP-WI) successfully moved from the Frigg to the center of the state GOP establishment by hiring leaders who were tied into Republican leadership. AFP-WI also built on partnerships with existing conservative groups in the state to build up its grassroots membership base. The chapter started as a small, one-man operation and the first director, Mark Block, was a controversial political consultant and former legislative assistant to a Wisconsin congressman, Bill Steiger. Block had previously been sanctioned by the state for illegal campaign tactics and was a well-known “dirty tricks” operative. Yet he enjoyed strong connections to other conservative grassroots organizations in the state, which helped AFP-WI gain early members and visibility. When the Tea Party burst on the scene in 2009, AFP-WI was heavily involved in promoting Tea Party events and activism. AFP-WI hosted a tax day Tea Party rally in 2009, and made a point to include Tea party speakers at AFP events and sign up Tea Party participants as AFP grassroots activists. Yet it would be a mistake to think of the Tea Party as being simply an astroturf operation from the Kochs – AFP built on but did not create Wisconsin’s Tea Parties.